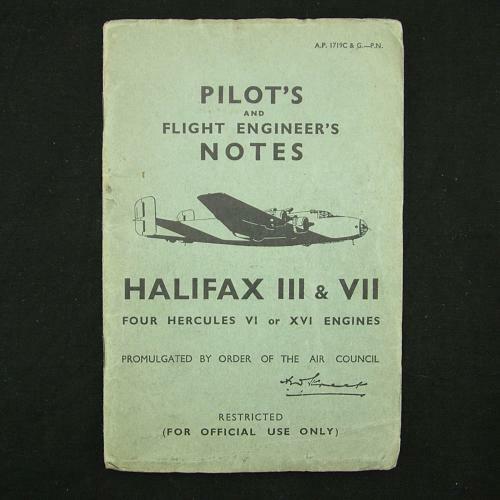 A.P.1719C & G. Pilot's and Flight Engineer's notes for the Halifax III & VII. Original copy dated 10/44. 46 pages with pullout diagrams/photographs. Covers a general description of the aircraft plus information on handling, operating data, emergencies etc. Official amendment sheets have been glued at the backinside covering the period through to September 1944. The cover is dog-eared/creased at the edges/corners. Pages are generally good bar light soiling and rusted staples. Quite good used condition. Stock code P18262.